Content Marketing - when it comes to content more isn't better, better is better. Content Marketing has become more important over the past few years. It has become more important with the change in role of consumers. We have more active roles within the buying process. Before we talk to a sales person, if at all, we go through a process of discovering information, learning what we can, choose and then purchase. After purchas there is the implementing state, proving and owning the product or service. 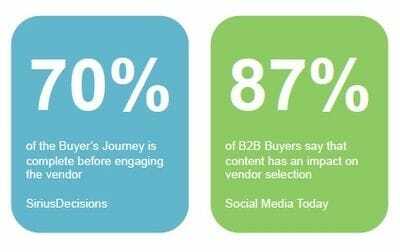 For content to be successful it need to engage and convert buyers. Your content needs to tell the entire story of your company and needs to connect with the buyer in all they ways they need throughout their buying jounrey. When the buyer has reached a tipping point they realise they have a pain that they need to learn more about. This is where content marketing can be so effective. We work with you to create the tools you need to deliver compelling content. The first step to effective content marketing is understanding how your customers buy. Your buyers go through a journey where they have different needs and questions. High quality content can help move a potential prospect to a loyal customer advocate. See the stages that your customers are moving through below. In Discovering, the buyer has reached a tipping point, realizing they have a pain point they need to learn more about. The buyer conducts educational research to better understand the pain point they're experiencing. This research includes defining the problem, understanding potential causes, seeing how others have tackled the problem, and exploring best practices to address the issue. Based on this research, the buyer clearly defines the problem and decides that it's worth moving forward to address it. In Learning, the buyer researches possible solutions to solving their defined problem and begin to identify specific providers. They take into account the various choices available to their business needs and create a broad list of solution options. In Choosing, the buyer needs to prove to internal stakeholders that a solution is worth employing to address their problem. Once this is approved, the buyer compares and contrasts solutions, cuts their broad list of solution options into a short list, and then makes a final decision. In Purchasing, the buyer is actually procuring the solution and preparing for owning, maintaining, and deploying the solution. This requires planning, internal alignment, resourcing, approvals and all the things the buyer need to do internally to complete a purchase. In Implementing, the buyer is deploying the solution, setting up users, receiving training, etc. This process typically involves educating and incorporating a new wave of people to the solution and the process, potentially from diverse groups across the organization. 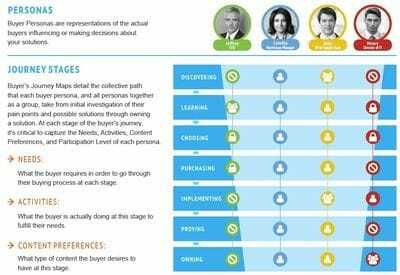 In Proving, the buyer is now using the solution and evaluating its qualities, benefits, and ROI or soon to be ROI. In Owning, the buyer is using the solution, maintaining it, receiving updates on new capabilities, realizing its ROI, and expanding their usage of the solution. Ask as about how you can improve your Content Marketng today.